In a relational database in a many-to-many relationship, a row in table X can have more than one matching row in table Y, a row in table Y can have more than one matching row in table X. In Object oriented programming, one instance of entity refers to multiple instances of another entity and an instance of that another entity refers to multiple instances of the other entity in the relation called many-to-many relation. In this tutorial used the relationship between Engineering Branch and Subjects that are having each Engineering branch in a semester. In an Engineering college each Branch have many Subjects and each Subject may appear in many Engineering branch semester. A join table is a table in database that represents the multiple references of one or more table . In other words a join table is used to refer multiple records of one or more tables by using foreign key constraints. Below image illustrates more about many-to-many association. Bidirectional relationship provides navigational access in both directions, so that you can access the other side entity without explicit queries. * The persistent class for the Subject database table. 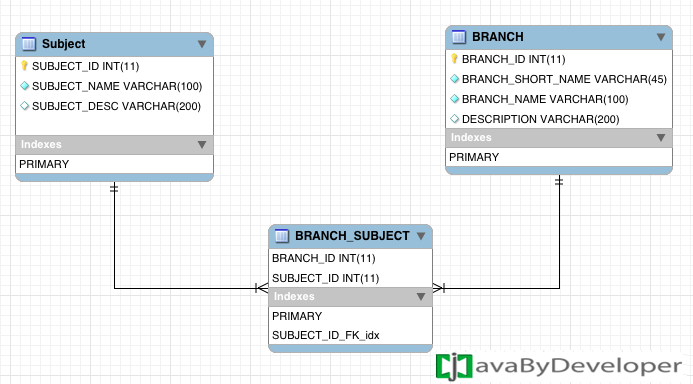 * The persistent class for the BRANCH database table.